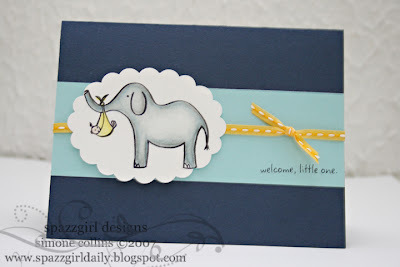 I love love love this A muse elephant stamp, think it is adorable for a baby card, so I made several. Then realized, I know no one who is pregnant. Or anyone who has recently had a baby. Probably won't stop me from making a few more cards with this little Elephant. And to think that I actually hate elephants (long story or several stories) but can't put down this stamp. Ribbon is from Archivers, super cheap, like 29 cents a yard, I think.